Posted on February 4, 2019 at 5:47 am. We begin today with WOLF PACK PRIDE!! The WMS Art Department racked up the glory at this year’s Scholastic Art Competition. More than 30 Williamsburg students combined to win over FIFTY awards for their incredible art projects — including Honorable Mention, Silver Keys, and Gold Keys. Much of the winning artwork — like these that you see on the screen — will be on display at the APS Central Library during the month of March. 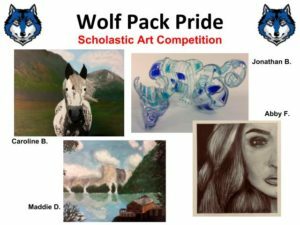 Way to go, artistic wolves!! [clap]. But that’s not all, the Gold Key projects will now be entered into a NATIONAL art competition — where they could win scholarships worth THOUSANDS of dollars. Good luck, wolves! And now for an important announcement for all students who are competing in the Virginia Junior Academy of Science. The VJAS meeting has now been RESCHEDULED for TODAY in room WW 22 during Wolf Time. If you are not able to make it, please be sure to see Mrs. Warden as soon as possible. Once again, the VJAS meeting is this morning immediately following the Morning Announcements in room WW 22. The Technology Student Association — a.k.a. the TSA — WILL be meeting TODAY after school in the main lobby. Participants will be continuing construction on the paper mache “Kindness Tree.” So if you’d be so “kind” — come on down and lend a hand! See Mr. Dudek with any questions. Do you like to ride bikes? Interested in learning bike maintenance skills? Then the WMS Bike Club is for you! A representative from Phoenix Bikes will be visiting WMS this TUESDAY during all grade-level lunches — to take questions and recruit new members. Club meetings begin the following TUESDAY, February 12th, during ASP 1 and 2 in room 124. See Ms. Scruggs with any questions. Let’s ride!! Looking for something to do after school? The ACT II Inventions class begins on TUESDAY during ASP 1 and 2 in room 129. And you’re in luck — because there are still few seats left! Interested students are encouraged to see Mr. Dudek after school for more information. See what YOU can invent! Attention 6th and 7th graders! Believe it or not, but it’s already time to sign-up for next year’s classes! Whether you’re staying at WMS or going to the new Dorothy Hamm Middle School next year, your Course Request Form — the CRF — must be turned-in to your counselor by this FRIDAY at the latest. And if you’ve lost your CRF to either school, be sure to get a new one from your counselor ASAP!! If you miss the deadline, you could get stuck with a class that you don’t really want. So stop procrastinating and complete your CRF! See you grade-level counselor with any questions. Batter up! The Yorktown High School Softball Team is inviting 8th grade girls to try out for its upcoming spring season. Tryouts are scheduled to begin on MONDAY, February 18th — which is a school holiday — from 11:45 to 2:30 on the YHS softball and turf fields. Interested student-athletes should make sure your physical is on file. See Ms. Sutphin with any questions or for more information. “I’m so glad I didn’t buy a yearbook” — said no one, EVER. The deadline to buy your yearbook is February 22! You have just 23 days to order that from the WMS website. Not sure if you bought one yet? Ask any yearbook staffer, they can look it up! Or stop by room 137!